Tested by holding C on levels 1-3, using potion on level 4, then going to level 5, collecting and using another potion. It's been so long since I played the ST version. 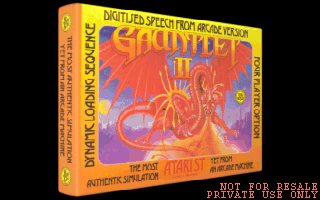 Correction…the original Gauntlet on the ST. How do you isolate the magic to a single player if it was accessed via the keyboard? Did they have 4 different keys so each player could use only their own magic? Did they have 4 different keys so each player could use only their own magic? Yep each player had a key for magic. Not exactly ideal but having Gauntlet II and the 4 player adapter with a group of friends sure was is a blast! My hats off to Cyranoj for making these St conversion. Can anyone confirm this I've made it to level 13 I had a delay when trying to use the potions I've collected, I couldn't use them back to back. Edited by walter_J64bit, Sun Jan 11, 2015 4:06 PM. I can reduce this time if it's too long. I know of another "II" game… MIDI Maze 2. The Jaguar and the Lynx both deserved to have MIDI Maze ports to them back in the day. I wonder if that ST wrapper could simulate MIDI over the JagLink networking. From what I remember, the Lynx's ComLynx port was either actually MIDI or was compatible with it. Please and thank you, it does affect gameplay. It's not a problem to reduce this, but in what way does it affect gameplay? The only possible reason to spam magic I can think of would be to fight a dragon? I haven't seen the Dragon yet. I was surrounded by multiple deaths my button pressing had no response until it was too late. Edited by walter_J64bit, Sun Jan 11, 2015 7:11 PM. I don't remember a dragon in Gauntlet II. There's a giant dragon in the Quest Mode of Tengen's Gauntlet IV [Genesis/Mega Drive] and probably one in Tengen's Gauntlet on the NES. Yep they are in there. There's one on the monsters screen, and in game when you kill it you get the "I've not seen such bravery!" sample. Edited by CyranoJ, Sun Jan 11, 2015 8:27 PM. The wikipedia article also mentions there most definitely be dragons somewheres in there. Not really. It would need extra hardware to drive a single MIDI device, and it wouldn't work at all for MIDI Maze "as is", as it requires a "loop" network and separate input/output for each machine. The Lynx doesn't have that: all inputs and outputs from all consoles on the network are "mixed" with each other. It would require at least a rewrite of the networking code. On the Jaguar it could be done for two players. For more than two players, you'd need either special cables, or a code rewrite. You'd need to work around the hardware UART bug too. Think this one might be it for a while, got some other things to do. Edited by CyranoJ, Mon Jan 12, 2015 1:33 AM. Atari should did "St's Greatest Hits" for the Jag. Is just Awesome! Edited by walter_J64bit, Mon Jan 12, 2015 7:08 AM. Ok this got me to drag my Jag out of the closest and also to unwrap my Team Tap which was only used once for a Barkley Jam game - or NBA Jam cant remember. Looks, sounds, and plays just like the ST version I fondly remember! I only have 1 problem which Im not sure if Im doing something wrong. I have my pro controller in port 1 and my team tap in port 2. I have 2 joypads connected to the A & B port of the team tap however I can only start the first 2 players. I cannot join the 3rd (port B). I have moved the controllers between port A and B and both work in port A. I tried C&D with no luck either. Plug the teamtap into port one and run all 4 controllers through there. Make sure it is plugged in when you boot up the game. It should work fine then. I can see why they did it, but it's not a very forward-looking decision to have people stick the TT into the 2nd joypad port for games with more than 2 players. It only makes sense if the max. possible players would ever be 5, but the device allows for 8 players with 2 TTs... once a game exists with 6 players or more, having players 2 to 5 on the 2nd TT and players 1, 6, 7 and 8 on the first isn't so tidy and would be an issue for the devs to make things seem more logical to the gamers. It's likely a knock-on from SNES multitaps and Nintendo forcing devs to use the 2nd port for theirs (and never making or certifying a game with over 5 players, although d4s made one a while back with eight). Ideally, a game that supports 1-5 players should continue the existing precedent set by the released titles bitd (lol, 2 games) and use the 2nd port for players 2, 3, 4 and a 5th, as that's what people would expect. If a game supports more than 5, the devs are obviously expecting a TT in each port and it's up to them to make things sensible and simple for the people sat holding the pads. Edited by sh3-rg, Wed Jan 14, 2015 3:11 AM. Thanks for the tips - got my 3 player game running last night and it was awesome! Even when my kids were little I couldnt find much on the Jag to hold their interest, as teenagers with XBOX One forget it - they loved Gauntlet II with 3 players jamming through the levels. They cant wait to play again! What you are saying is that I should patch Leatherneck, and add TeamTAP to Expressway, so that I can change *MY GODDAMNED WAY* to the default supported by the most games? Honestly still amazed you got team tap support to work on Gauntlet. FRAK! Thanks for the info, Zerosquare. So much for the idea of hooking up a Lynx, a Jaguar, an ST, and an XEGS for MIDI Maze. Or Slime World. Code rewrite. And it's not like the apparently brilliant networking code from Battlesphere will ever be shared.